French Provincial Dressers are one of the most perfect designed dressers to paint abstract designs. They work so perfectly because painted furniture was common on Antique Louis XV and XVI furniture, so the look transfers easily to french provincial pieces. The Union Jack Flag has caught attention of the design crowd, and the geometrical flag has been featured in a number of interior design blogs and magazines and it has even made its way into fashion. Upholstered furniture is the new trend with these geometrical flags, but can be very tricky because flags are often not sold by the yard or meter at your local fabric store. 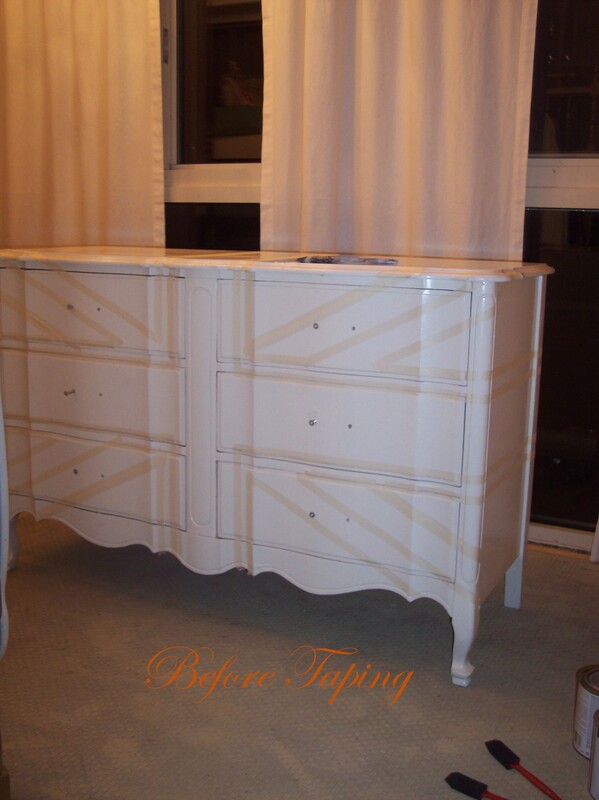 Painting a piece of furniture on the other hand can be very easy with any flag pattern. With my flag dresser, being that I was working with the Union Jack Flag, I painted my piece in white to begin with. Then I taped the lines of flag, and once the paint was dried, I removed the tape, and added a brown glaze to antique the dresser. (If I were to do it all over again, I would certainly use a flat paint instead of an oil based color. The reason for this, is oil paint can be very thick, and working with tape, you want your paint to COVER in one coat (or 2), not making it so heavy that when you pull off your tape there is an obvious ridge where the paint built up against the tape. Flat paint usually is the best to use when you are working with bright colors. Learning from experience, it took me about 8 coats of semi gloss paint to paint a wall orange. In the end, the walls were not perfectly finished because each layer of paint makes your walls imperfect. You always want that sanded finish that fresh drywall provides. The lesson I learned that I can pass on, is to make your first coat flat, and if you want a gloss, then paint it after your walls are covered with the flat paint. So my recommendation after doing this flag dresser is to always sand first, and paint in flat paint for all your colors, and then go over the dresser with a WATER BASED polycrylic clear finish when you are completed. Never use oil based polyurethane on white. In a year it will turn a ugly yellow, if not in a day. OMG I love this dresser! 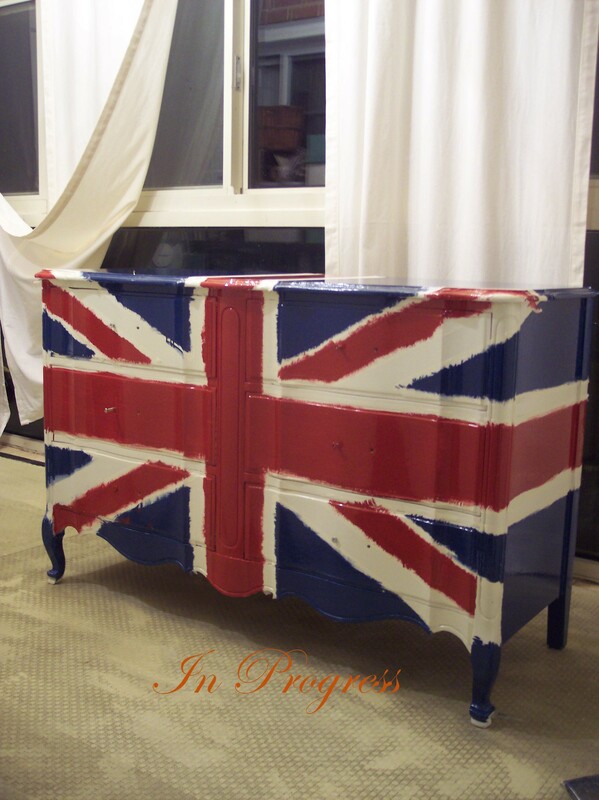 The painted dresser with the Union Jack is stunning. I also love oil base paint the best because it’s easier to sand between coats. Did you sand between coats. I have a big project that I’m going to attempt but I must contact you first. Your blog is fabulous. I will contact you* My contact info is michaelandmeranda at g m a i l .c o m (No spaces) Thank you for all the complements. I do sand in between coats, because oil paint is very thick. When I apply the oil, I also use a sponge paint brush to even out the oil, so there will not be any raised areas when the paint dries. I love love love love this. This has to be the best before and after I have ever seen. Gorgeous. Thanks for sharing. why are you calling that a dixie flag? The brand of the Furniture is Dixie French Provincial, and the pattern on the dresser is Union Jack. I can see how that is a bit confusing. I am sorry Laura, I cannot remember which colors I used. I plan on doing another, but this time, I will remember to write down what paint colors I will use. The nextg time around I am going to try darker colors instead of the brighter colors. Also, I plan on using a fairly flat finish so I could add a brown glaze on top. The union jack dresser was my first, and it turned out very nice. That dresser is stunning! Its exactly what I need to do for my guest room. Why didn’t I think of this? 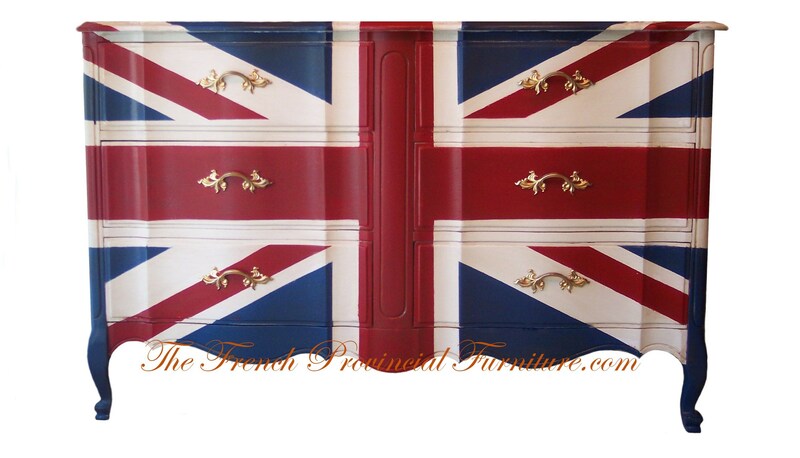 I am quite the anglophile, so it’s perfect for my guest room/getaway for mommy room! Thanks for the inspiration…I will be working on the ugly dresser I have in there, this week! Hmmmm…now to find the right red and the right blue, we’ll see!! Love it! why is Kate Moss flashing her knickers? In your Sept 12th entry you said that the next time you attempt this project you will add a brown glaze at the end. What effect will that have? When you add brown glaze to a painted piece it takes on an antique effect. It doesn’t look so new.